How much did you love the ombre meringue parafait diy? Totally doable and such a show-stopper. 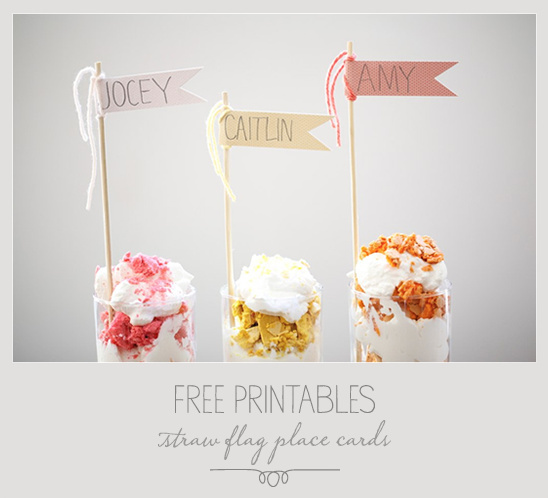 To add that extra wow factor and personalize your delicious treat, make these easy straw flag place cards. Simply print out the template by clicking here and follow the below easy steps and you are on your way to the cutest place cards ever. After printing out the template, carefully cut out the banners and fold them in half. Write your guests name out on the cards. Run your glue from end to end on the inside of the flag. Place a kabob stick or straw in the center and close the flag together. Tie a little yarn at the top and voilà you are done. Place them in your ombre meringue parfait deserts, you r signature drink or a little flower arrangement. Guests will love them either way.